The latest version of vSAN puts the hyper-converged storage software into a wider range of use cases with better support for failover and a smoother management user interface. VMware's release of vSAN 6.7 in May 2018, along with vSphere 6.7, is mostly polish under the covers of the hyper-converged software, with relatively few added capabilities. New features are aimed at less frequent use cases or improvements to existing capabilities. Still, changes in the UI and improvements in failure handling make vSAN suitable for even more critical applications than before. First, a quick refresher: VSAN is VMware's storage software that takes local storage inside ESXi servers and turns it into resilient shared storage for virtual machines (VMs). The VMs are split into objects and stored across multiple devices inside multiple ESXi hosts. Each host has fast SSD for performance and a larger amount of -- usually -- slower storage for capacity. The capacity tier can use hard drives in a vSAN Hybrid model, or it can use SSDs for capacity and performance in a vSAN All-Flash model. All-Flash vSAN can have deduplication and compression built in to make more effective use of the more expensive SSD-based capacity tier. The vSAN storage cluster matches to a vSphere High Availability (HA) and Distributed Resource Scheduler cluster, where all the ESXi servers can consume the vSAN storage. Not all servers in the vSAN cluster need to contribute local storage to the cluster. A vSAN cluster can be split between two data centers, with a Witness host in a third location, to provide a metro storage cluster and automatically recover VMs after a complete data center loss. Recent vSAN releases have added the ability to use vSAN storage as iSCSI targets for physical servers, enabling more than just VMs to be stored. For many customers, vSphere HA provides a great level of application availability without needing any particular setup or handling for each application. For other customers, the inherent recovery time for HA is too long, and application clustering, such as Windows Server Failover Clustering (WSFC), is required to provide application availability for the business. With vSAN 6.7, VMware added WSFC compatibility by delivering iSCSI storage to Windows cluster machines. The ability to use vSAN as an iSCSI target was added in version 6.1, but WSFC is new to vSAN 6.7. This support includes WSFC clusters with physical servers, rather than just VMs, as we would expect from VMware. For those customers who need WSFC to meet business requirements, this support eliminates a reason to use a dedicated storage array, making vSAN more attractive. Since VMware retired the Windows vSphere client, users have been waiting for an HTML5-based equivalent. Now, vSphere 6.7 brings an HTML5 interface that is equivalent in features to vSphere Web Client. The HTML5 client can perform all vSAN management, making it possible to ditch Adobe Flash and its constant updates. The other management interface enhancement is the integration of vRealize Operations dashboards for vSAN into the vCenter interface, removing the need to switch between the two management products. The vSAN health checks have also been enhanced, with more checks for health and consistency across the vSAN cluster. 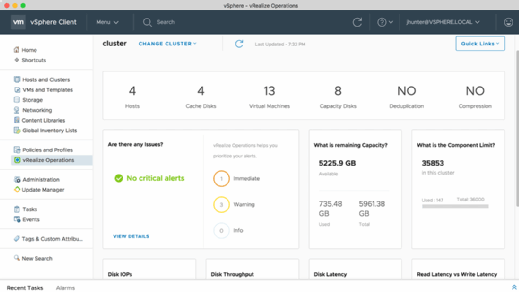 The vSAN 6.7 vRealize Operations dashboard enables admins to view storage diagnostics and alerts without using a separate interface and installation. There are significant under-the-covers improvements, too -- some of which address faster recovery from failure and others that are about improving performance. You may remember from an early release of vSAN that rebuilds after a failure would negatively affect the production workload. The worst of these issues were addressed with changes to hardware compatibility and throttling rebuild activities. In vSAN 6.7, more work has been done to speed up rebuilds, with a feature named Adaptive Resync. The significant improvements in failure handling show maturity in VMware's flagship storage product. Another enhancement is vSAN fast network failover, which keeps the VM paused for only a few seconds in case of a network interface card (NIC) failure. Previously, it took 90 seconds to recover. Many applications that run on a VM will register a timeout at one minute, making a pause of just a few seconds a big improvement for business performance. The metro cluster deployment is also improved in vSAN 6.7. You can choose to place traffic to the Witness on a different NIC on the ESXi hosts rather than use the storage replication network. Using separate networks can make the WAN configuration simpler. Some changes have also been made to how a metro cluster recovers after a site failure, which reduces the chance of VM outages when the failed site returns. The support for iSCSI-based WSFC will be welcome to a small set of customers. The complete HTML5 management interface will be more widely welcome as it will help remove Adobe Flash. The significant improvements in failure handling show maturity in VMware's flagship storage product. With the end of support for VMware's most popular version, vSphere 5.5, coming in September 2018, the addition of these new features in vSAN will make the forced upgrade more palatable for many users. Which new VMware vSAN 6.7 features will benefit your organizations the most?